Tacos + calzones. Two foods you typically wouldn’t see together. To be honest, its the combination of foods from different cultures that are my favorite ones. Like the kung pao chicken tacos. Two other foods that typically wouldn’t be combined. I love being able to take common dishes from different cultures and combining them into one. While this greatly pleased me on a combination of cultures level, it greatly pleased Tom as tacos and calzones are two of his favorite foods so combining them together could only produce something wonderful. 1. Preheat oven to 375. Line a large baking sheet with foil and spray with non-stick spray. 2. In a medium skillet, brown ground beef over medium-high heat. Stir in taco seasoning to coat and drain any fat. 3. Place each piece of pizza dough on the baking sheet. Divide the ground beef among each, placing on one side of the dough. 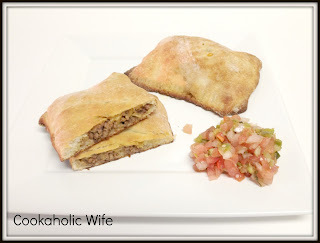 Top with cheese and cilantro, then fold over the other half of the dough to create a pocket. Pinch the seams closed with your fingers or a fork. 4. Using the tip of a sharp knife, create three slits in the top of the dough to allow the steam to escape. Spray the tops with each non-stick spray. 5. Bake for 20-25 minutes or until lightly golden. Serve with sour cream and salsa. These are tasty! Tom doesn’t like salsa and opted to dip his directly into taco sauce. Once I pulled these out of the oven I realized that we didn’t have any sour cream left, so I just had mine with salsa. I will definitely be making these again!